Although Texas has recovered from the severe drought of the past few years, conservation is the easiest way to ensure that the state has enough water for future growth. In fact, water conservation is an essential part of the State Water Plan. We encourage all Texans to cut back on water use. Billions of gallons of water are wasted every day from inefficient landscape watering. The key to watering lawns is to apply water infrequently, yet thoroughly. * Watering too heavily or too often can weaken your lawn, waste water, and carry soil, fertilizers, and pesticides into streams. Watering too little can also waste water because it does little to alleviate stress on grass from drought. Water before 10 a.m. to save water and maintain plant health. Watering in the afternoon increases water loss due to evaporation. Watering in the evening can make your lawn and plants more prone to disease. A general rule is to water up to 1 inch, once a week, as needed. Observe the grass to know when to water. At the first sign of wilting, you have 24 to 48 hours to water before damage occurs. To determine when you have applied enough water, put a 6-ounce tuna can on your lawn and stop watering when it is full. If you notice runoff before the can is full, turn off the water and wait one hour before turning it on again. Some plants may have lower water requirements. You may be able to reduce the sprinkler run time for areas of your yard with these plants. Replace your standard irrigation clock timer with a newer, more water-efficient controller and save nearly 8,800 gallons of water annually. New technology uses local weather and landscape conditions to determine your yard’s water needs. 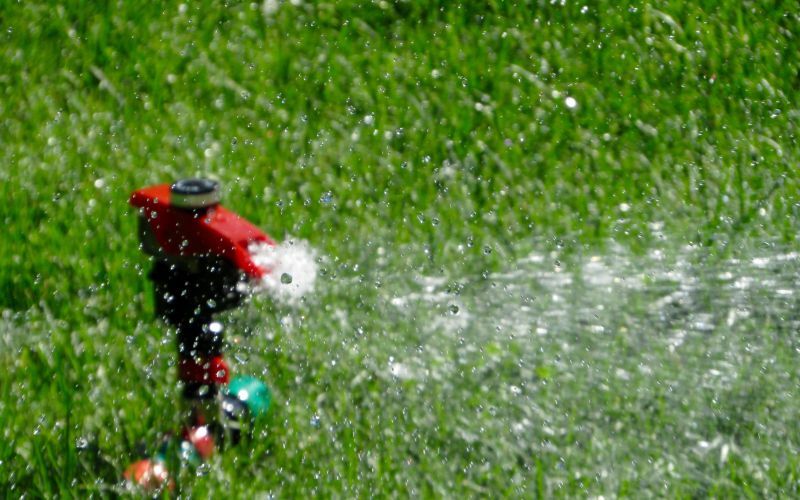 Ensure sprinklers are not watering sidewalks or driveways. Also, sprinklers should spray large drops close to the ground, rather than a fog or mist, which can be blown away by wind. Regularly maintain your permanent sprinkler system to make sure water is being properly applied, sprinkler heads are free from debris, water is flowing at the proper pressure, and the system does not have leaks. Consider alternatives to spray irrigation when possible. Drip irrigation can minimize evaporation and runoff by 60 percent or more. This system works best with plants such as ornamentals, vines, or vegetables. *When watering, always comply with your water system restrictions.